I have often wondered how to share the enormity of World War II with my children and students -- how to help them start to understand the enormity of the war, its complexities, and also its impact on individual people. My own family fled from German occupation of Czechoslovakia and Austria, and many who didn't leave were caught and killed. I feel strongly that children should learn about the upheaval that World War II caused, but how do we do this in a way that they can absorb? As parents and teachers we need to consider children's developmental stages as we introduce the terrifying and tragic aspects of war. 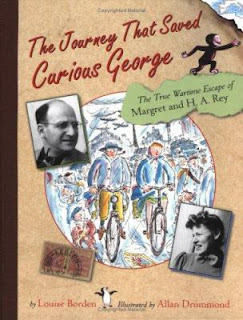 In The Journey that Saved Curious George, Louise Borden shares the true story of how Margret and H.A. Rey escaped Paris two days before the Nazis invaded. 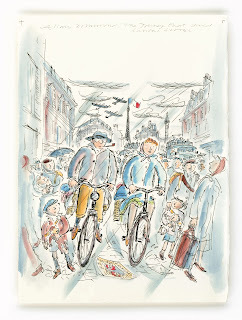 It is one of the best introductions I have ever read with children to this tumultuous time period in European history. Borden writes in her introduction that she had heard for many years about Margret and H.A. 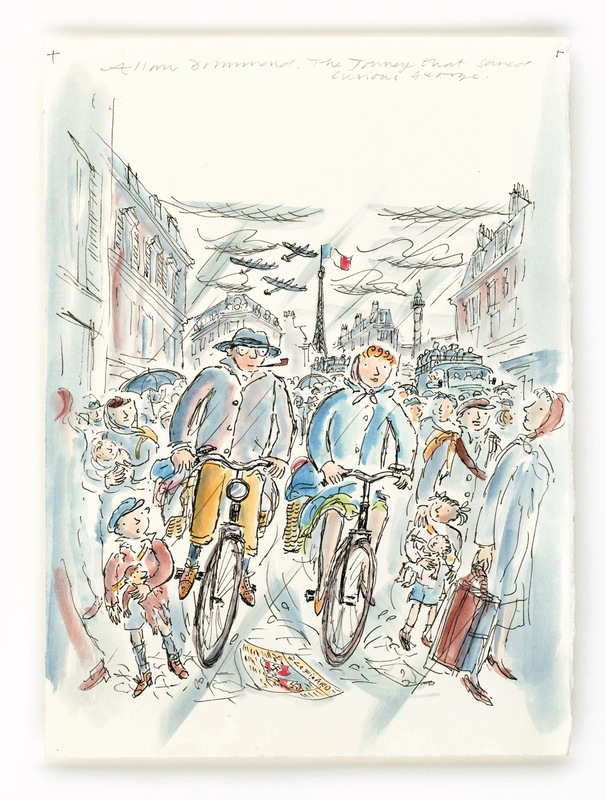 Rey's escape from Paris on bicycles in June 1940, just as the Germans were occupying France, but that no one could share many details. "The story felt incomplete. I wanted to know more. I wanted real images. I was curious, just like the Reys' famous little monkey, George." And so Borden embarked on her own journey, a journey of research reading the Reys' papers, notebooks and diaries, speaking to the Reys' friends and colleagues, and traveling to many of the places where the Reys lived between 1936 and 1940. Margret and H.A. Rey were both born in Hamburg, Germany in 1906 and 1898, respectively, to middle class Jewish families. Borden helps young readers understand the context of their lives, by combining clear text, photographs and illustrations. Readers immediately get a sense of Margret and Hans as young people, but also the times and places they lived. The Reys returned to Europe for their honeymoon in 1936 and ended up living in Paris for four years. 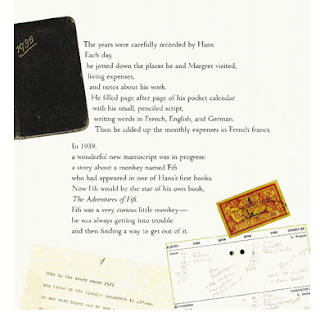 During this time, they began writing and publishing children's picture books. As the Nazis began invading European countries, the Reys became concerned. When the Germans invaded Holland, Belgium and then northern France, it became clear that the Reys needed to make plans to flee--and quickly. I especially love how Borden shows actual visas, passports and pages from Hans' diary to help readers see how she found the information to piece together for their story. This helps create a palpable sense of being there alongside the Reys, especially as they frantically tried to prepare for their departure. Alan Drummond's illustrations also convey the chaos, but the line drawings give more life and energy and the soft colors keep the mood from becoming too somber. 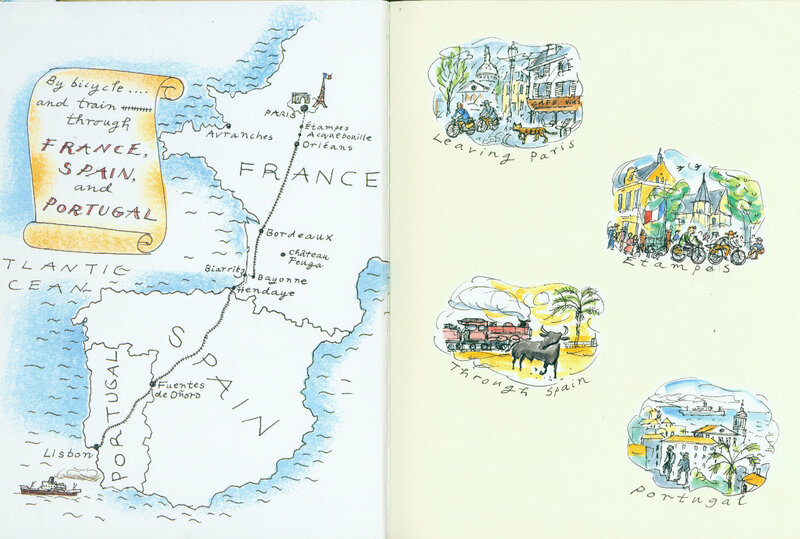 The illustration below show how Margret and Hans eventually were able to flee Paris on bicycles--two days before Paris fell to the German invasion. "Everywhere there was confusion and noise: grinding gears of overheated cars and the frightening drone of German scout planes. Constant and relentless were the honking to speed up the crawling procession of the largest motorized evacuation in history. More than five million people were on the roads of France that day. Among this sea of humanity were two small figures: Margret and H.A. Rey." This is an excellent nonfiction for elementary students--especially those who profess disdain for nonfiction. The text is broken up into short lines, creating plenty of white space for the illustrations to tell their part of the story. The descriptions bring you right into the action, and the pacing keeps readers moving until the dramatic climax of the Reys' escape. For more interesting information, definitely check out this Q&A with Louise Borden, from the publishers Houghton Mifflin Harcourt. I purchased these review copies for my personal library. If you make a purchase using the Amazon links on this site, a small portion goes to Great Kid Books. Thank you for your support. My friends, we live in a time when the world is being thrown about by so many forces. There are times when I feel swept under by the prejudice and hate that still engulfs our world. But then I look at the way we are able to create good in small measures--especially through sharing stories and songs and community--and I know that we can recreate our worlds step by step. I was thrilled and honored to share the Coretta Scott King Awards celebration with two students and two staff members from my school community. The awardees' speeches are still reverberating within me. 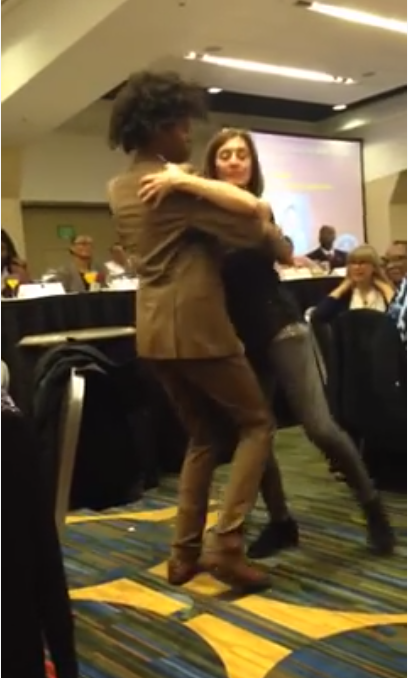 Christian Robinson spoke about how Josephine Baker had always inspired him with her courage and determination, and then he and Patricia Hruby Powell danced with delight. Kwame Alexander, accepting the CSK honor award for The Crossover, read a poem he had written just a few nights before, filled with hope, pain, and the determination to change the world for our children. "I can barely hear, over the silence of all those children, those lives that we have cut out of our literature. I am frightened by the possibilities that all of their voices, so long censored, can only now be heard on news broadcasts in burning cities, on endless loops of helicopter film footage." The pain he talked about reverberates through me--as an educator, I am so disheartened by the persistent racial achievement gap in my community. And yet, Chris also talked about the power of stories to change our world, to create new worlds for our children. "I’d just about given up on the world. Then I remembered that I am a storyteller, and in the hands of a storyteller, we can make new worlds. Our narratives can carry the full weight of the past and build infinite futures. With pens and word processors, with paint and ink and collage, we can, like Misty, like my father, create possibilities where there weren’t any before. Rewrite reality. And there will be days I want to give up on the world as it is, but I will never give up on the worlds that I have yet to make, the worlds that my friends are making, the worlds that all of us here share and do so much to bring into reality." Jacqueline Woodson began her speech by talking about the power of community, the power of gathering together in a room to celebrate and to share. In this age of online communication, it is so important to carve out time to be together in person. But then she went on to talk about the strength of our broader community, both in the ancestors that walk with us every day and the people who hold us up here and now. "We are here because of our ancestors and elders and the people who hold us up every day — thanks for helping all of us never forget them or the way each of us finds a way to make a way out of no way — every single day. 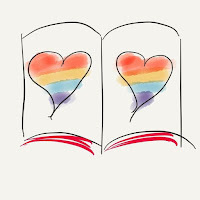 Thank you so much, all of you who believe in Diverse Books, who believe in keeping young brown children — and all children — dreaming." 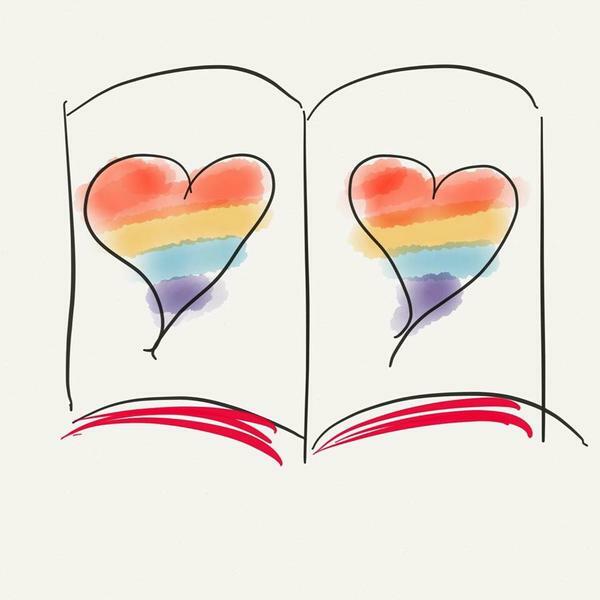 This community of authors, illustrators, and librarians comes together to keep our children dreaming in the possible, in making new realities. It is hard work, advocating and supporting and promoting good literature that speaks to children. But together we can. The Answer is Yes. That's it. I want to share that buoyancy, that power to keep afloat, with my students. And I am sure, as sure as I can be, that our stories help us not only see ourselves but also see what our world can be. The Answer is Yes. Please take the time to read the Coretta Scott King Award acceptance speeches, published in The Horn Book and available online. Thank you to Andrea Davis Pinkney who helped me bring my students to the CSK breakfast. Thank you to all the honored authors and artists for inspiring us to keep sharing stories with students and with each other. Thank you to my family for supporting me and helping me celebrate with the world beyond our immediate community.